Maths activities for preschoolers work best when they are fun (of course!) and practical – using real objects the children can feel, rather than abstract numbers on a worksheet. Try this fruit cocktail maths activity for some tasty number practice. 1. Talk about the fruits that would be great in a fruit cocktail and have the children write or draw a list of possible ingredients. 2. Go shopping or raid the fruit bowl to find your ingredients and wash, peel and chop the fruit into pieces. 3. Recipe time. Have the children create their own fruit cocktail recipe and write or draw them out on a recipe card. You could use a 1, 2, 3 ,4, 5 recipe, where the children must pick one of some kind of fruit, two of another, three of another, and so on. Or use an ‘Adds up to ten’ recipe, where the children can pick any combination of fruits they like so long as they total ten pieces all together. If you’re interested in colours, you could make the rule that they need five different colours in their cocktail. If you’re interested in letters you could require that all the fruits in the recipe start with a different sound. 4. Eat and enjoy your bowl full of numbers. You can find lots more preschool maths activities in our maths archive. Fabulous ideas… especially good to get reluctant counters doing maths without even noticing it! Oh yum huana, ice cream maths sounds even better! Sweet! I love ideas like this that can be manipulated to appropriate levels of learning! And a healthy snack too that they’d love to eat – because they did the creating! I love these ideas and the variety of ways to play! What a great way to introduce number and new fruits. This looks like a lot of fun. Love how simple and on-the-fly this activity can be, my friend! And I love that it’s involving healthy foods for our kids! I love real life math! 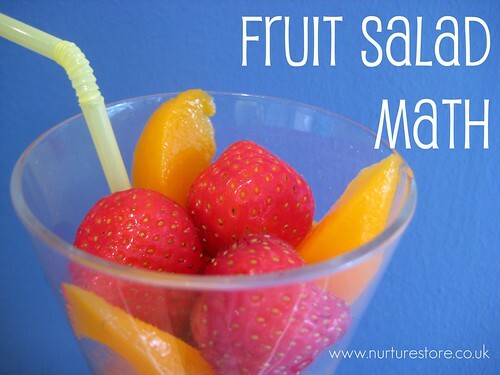 This is a fun idea for little ones – and it’s healthy! Great activity. We will be doing this one for sure. What clever ideas! Thank you for sharing at the Smart Summer Challenge! That is a great idea! My little boy would love this! He adores fruit and numbers!